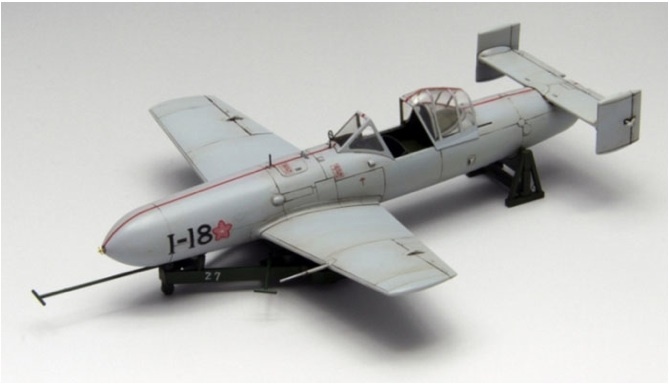 Fine Molds have recently released two 1/48th scale kits of the IJN 'Ohka' (桜花 cherry blossom) rocket propelled and piloted bomb, the MXY7 used for special attacks, usually dropped from a Mitsubishi G4M2 'Betty' bomber, and the K1 unpowered glider trainer. 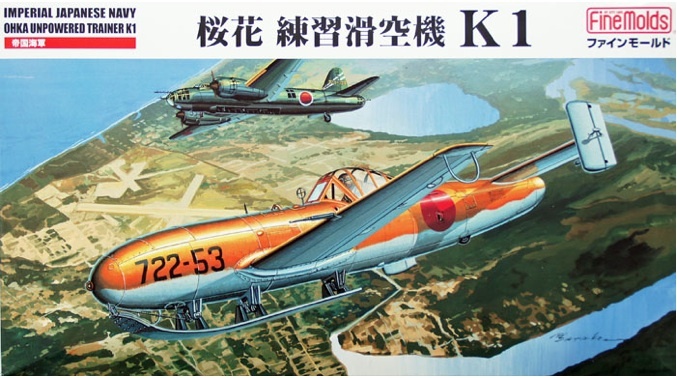 There have been previous kits from Hawk (as 'Japanese Kamikaze Piloted "Baka" Bomb' and in a double kit with a German V1) and Tsukuda (a Hawk re-pop) said to be to 1/41 scale and Kora have released or are due to release a model of the later Ohka Model 22 in 1/48. A 1/72nd scale Ohka was included in the Hasegawa Mitsubishi G4M1 'Betty' bomber issued in 1969. 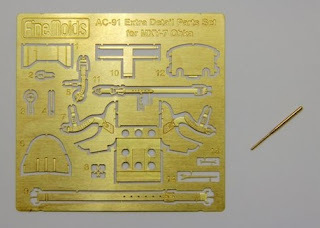 A photo-etch sheet designed to be used with the new kit is also available separately from Fine Molds (!). At that price you might think . . . . 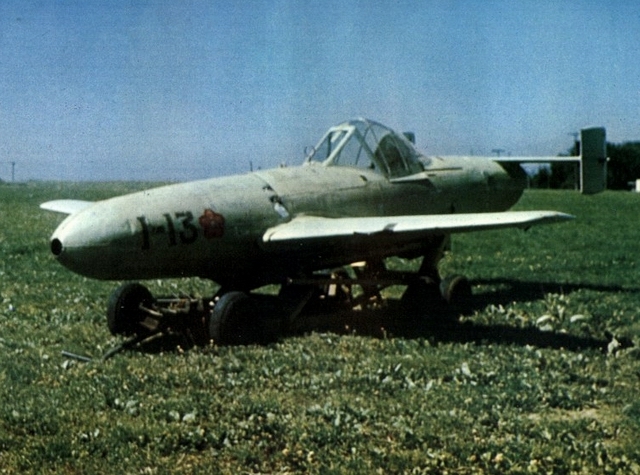 It consists mainly of seat, seat belts, armour plate and other cockpit fittings together with a brass pitot tube. 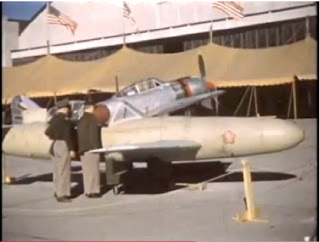 The US authorities coined the Japanese term 'Baka' (馬鹿 fool or folly) to describe this weapon, said to be for propaganda reasons in order to downplay their concern at the Japanese suicide tactics. It always irks when contemporary terrorist attacks are sometimes compared to the Japanese suicide attacks by ignorant (or lazy) media writers. The Japanese made those attacks as uniformed combatants, flying military aircraft against legitimate military targets in a theatre of war. This is not to forget or in any way to denigrate the many victims of the attacks, who were also soldiers, sailors and airmen fighting for their countries and doing their duty. And it is not to excuse or justify the war aims of the government that sanctioned them. 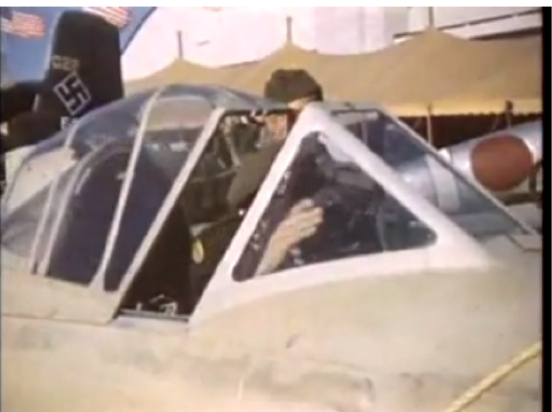 The final writings of the special attack pilots reveal that many of them, far from fitting the popular stereotype of fanatics, expressed anxiety, sadness at the prospect of their premature deaths, concern for their families, an instinctive awareness of the ultimate futility of the enterprise but above all a deep sense of unavoidable duty. The peer and hierarchical pressure in their decisions to volunteer for these terrible missions are not to be underestimated. The young Japanese pilots who volunteered were servicemen responding to a rigidly imposed hierarchical militarism in which the concept of sacrificial death in battle and duty to their homeland was central. The Imperial Rescript to Soldiers and Sailors (軍人勅諭 Gunjin Chokuyu) issued by the Emperor Meiji in 1882 contained the precept that "Duty is heavier than a mountain; death is lighter than a feather". 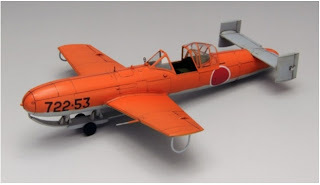 I suppose it is possible to build a model of an Ohka and give no thought to the underlying moral and philosophical aspects, the distinction between an aircraft carrying a bomb and an aircraft designed as a bomb is perhaps a fine one, but for some it may be more difficult. 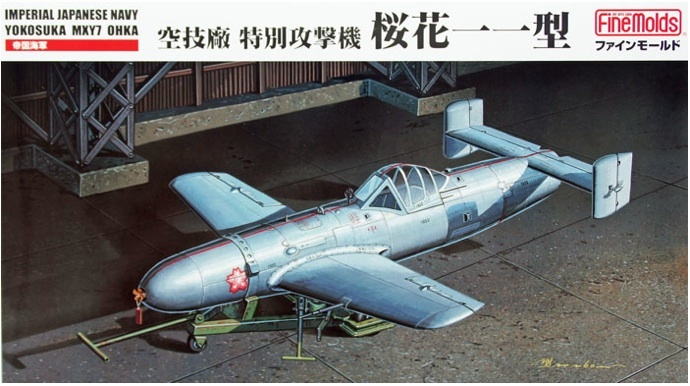 Fine Molds have already released models of the "human torpedo" kaiten - (回天 - difficult to translate "shaking the heavens") and midget submarines used for one way missions so the Ohka could be seen as a logical continuation of this theme. 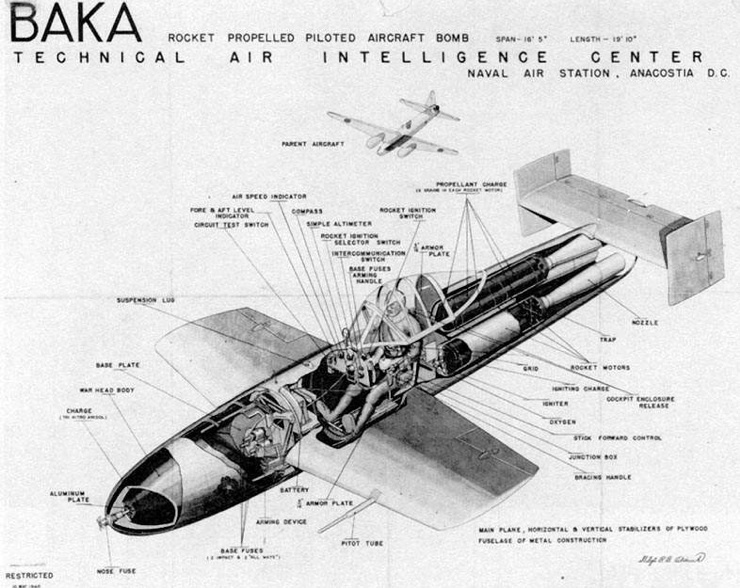 Ohka has a special resonance for me because at about the age of seven I sat in the cockpit of one overseen by my father who pointed out the sparse controls and how they worked. 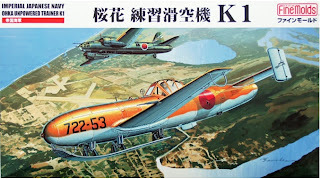 It was the origin of my interest in Japanese aircraft but the concept was, and remains, a chilling one. Leaving aside the difficult moral and philosophical dimension to focus on modelling this aircraft there is the perennial question of colours. 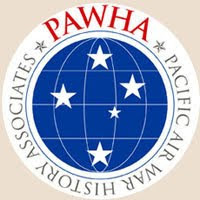 Ohka is often depicted in the whiteish grey associated anachronistically with the early Zero or sometimes in a light green as with Hawk's kit. 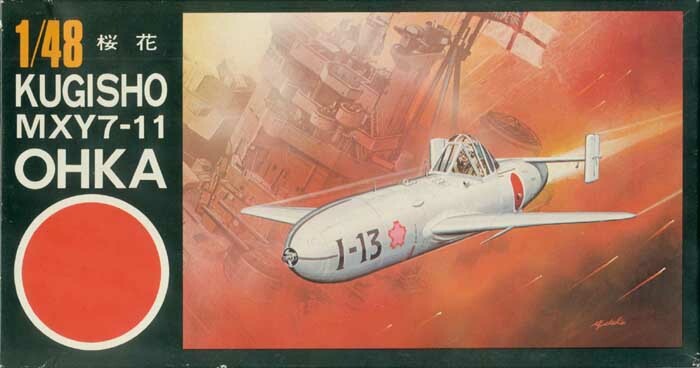 The Fine Molds kit instructions suggest overall GSI Creos (Gunze) Mr Color # 35 IJN Grey (Mitsubishi), which is a bright, slightly blueish grey of Munsell 4.7 B 6.5/0.5 (close to FS 36373 @ 1.26), conceived in the 1980's and purporting to represent the early Zero colour. However, a pale blue-green around Munsell 2.5 G 8/1 and 5 G 8/1 has been authoritatively reported from extant samples for the fabric covered plywood wings and tail assembly. The fuselage and metal parts are reported to have been painted in an "olive grey" (amber grey or yellow grey) around Munsell 5 Y 6/2 to 7.5 Y 6/2 similar to the early Zero. Some colour photographs and film (view from 1:09) do suggest that this is not simply due to thermal ageing of the paint surface although no doubt that might be a factor in the current appearance. The main reason for the yellowish caste of the "grey paint for light metal", touched on before, was the presence of zinc yellow (chromate) and hydrated iron oxide (synthetic yellow ochre) in the paint (as contained in RLM 02). The slight olive caste is created by the interaction of the basic grey (black and white pigments) with the yellow and intensified by the addition of small quantities of Prussian blue pigment intended to offset the yellowing effect on the grey (don't try this at home folks - well actually, do, as it will be helpful in understanding how these pigments work together and the character of the resulting colours). The colours shown above are those as reported in the linked article but it is perhaps best not to follow them too slavishly as the contrast between wings, tail and fuselage might be stark on a small 1/48th scale model. 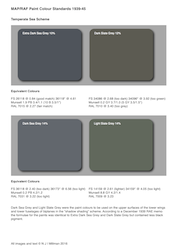 A more subtle difference between a cool, slightly blue-green grey and a warm, slightly yellowish grey will work better visually. 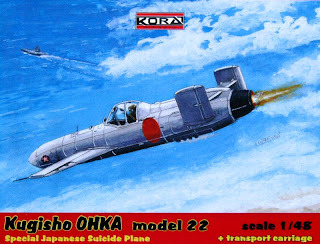 A superb 1/72nd scale Hasegawa Ohka, displayed here demonstrates this more subtle effect. 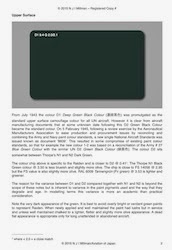 The two Munsell values cited for the metal paint are very close to each other @ 1.81 so the difference need not worry but there is no close FS 595B equivalent to this colour. 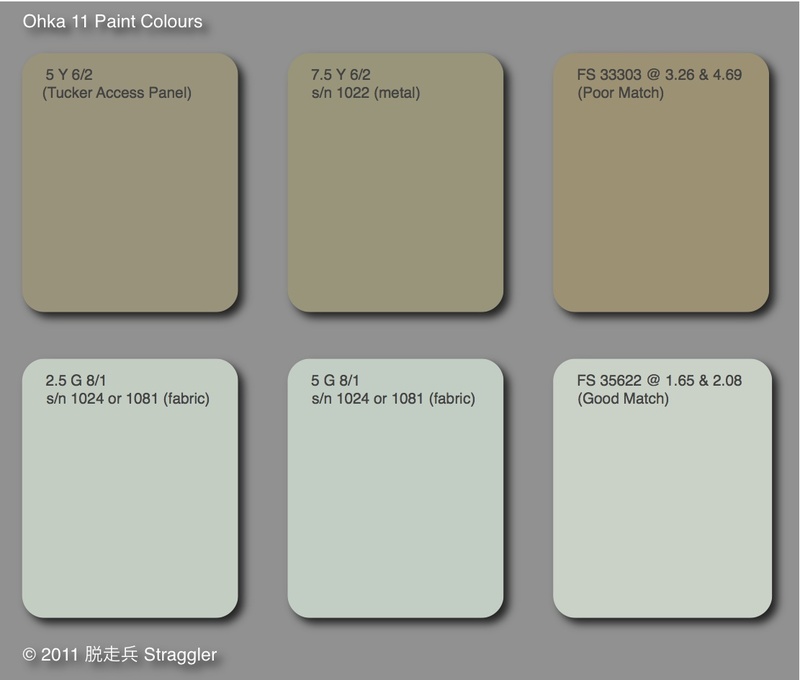 The closest, FS 33303 @ 3.26 & 4.98 respectively, is a poor match, being too brown in appearance and without the slight green or olive caste that is present. 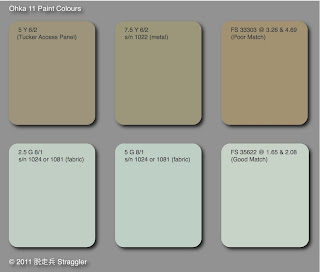 The closest FS 595B value to both blueish grey fabric paint values is 35622 @ 1.65 and 2.08 respectively, so a good match. Coincidentally this is the same FS value that is closest to the Du Pont MAP equivalent paint standard 71-021 Sky Type S Grey - a pale duck egg blue applied as an equivalent to Sky on early US manufactured aircraft exported to the RAF. But by all means experiment and if you prefer an all-grey Ohka so be it. 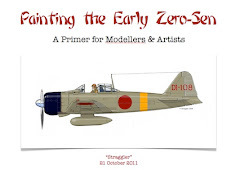 In terms of approximating the colours on a model Japanese modellers always seem more comfortable with the concept of absorbing the available data and settling on a personal interpretation of it - and accepting the inevitable differences between models without fretting over them or trying to impose their preferred solution on others. Western modellers on the other hand, appear more inclined to seek a "consensus" - that old impostor which can sometimes become the origin of a modelling convention that is flawed rather than factual. Too often the well is poisoned by "innocent" questions prefaced in the expectation of a "controversy" and/or containing their own half-arsed answers which leaves this pragmatist cold. Bearing in mind the arcane subject matter the bold and unequivocal statements sometimes made about colour on forums, as though Japanese (and other) aircraft were really painted in Tamiya or Gunze hobby paints, never cease to amaze - especially those gems that begin with "I don't know but . . . ". Internally Robert C Mikesh reports evidence of yellow-green 'aotake' in the cockpit interiors of the three examples in the UK*, but bear in mind this appearance could be a shift from an original brighter blue-green or malachite. The seats, seat mount, canopy latch fittings, brace handholds and other steel components were painted black, but the instrument panel was also 'aotake'. 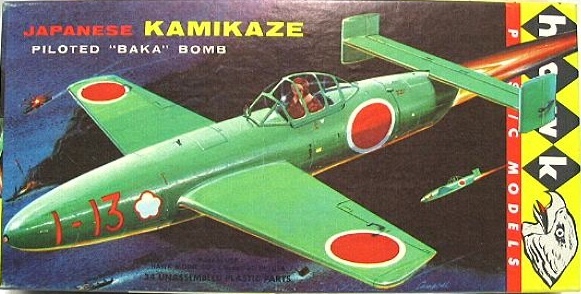 Note that this interior colour for the Model 11 is in contrast to the darker green opaque paint reported for the Ohka Model 22 in the same source and in Asahi Journal Vol.3 No.1 'Japanese Aircraft Colours at NASM'. None of the ready made 'aotake' hobby paints achieve a really convincing appearance, often glaring out at the observer as modern metallic paint, and it is better, if you have the patience, to mix the colour and apply it as a semi-translucent varnish over a bare metal finish as demonstrated here and also shown here. Scale and shadow does come into this though so the "gleaming" appearance of a 1950's Japanese robot on a small model is best avoided. For Humbrol users approximate 50/50 combinations of 88 Deck Green and 104 Oxford Blue, lightened slightly with 109 WWI Blue can be used to represent both the Army # 3 interior indigo grey and generic 'aotake', thinned as appropriate. Image credits: box art © 2011 Fine Molds; box art © 1958 & 1960 Hawk & © circa 1980 Tsukuda ; model images © 2011 Fine Molds; TAIC drawing net; film stills author's collection; rendered colour chips © 2011 Straggler; colour photos net. Thanks as always for the thoughtful and informative post. 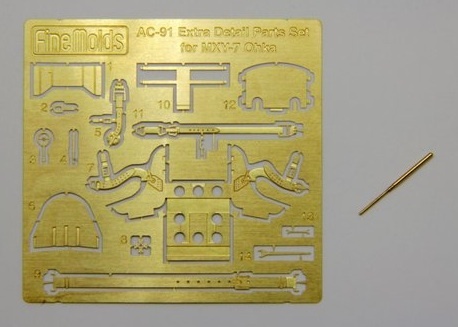 As you already know, I have a copy of each of these kits, and they are beautifully molded with very fine detail. 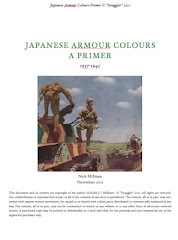 A very interesting article Nick - many thanks for highlighting a little recognised element of the Japanese developments during WWII. There was also an article in the July issue of 'The Aeroplane' on the Ohka by Australian writer James Kightly which alluded to Ryusuke Ichiguro and Tadeusz Januszewski's 'Japanese Special Attack Aircraft & Flying Bombs' (MMP Books. 2009). 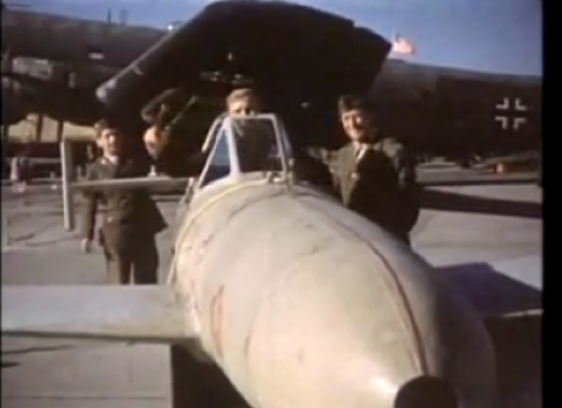 So - can you share the back-story on how you got inside the Ohka? Sounds fascinating...the nearest I've been to one is that I got to spend some time in a "George" and a "Rex" - but the Ohka would be far more fascinating. 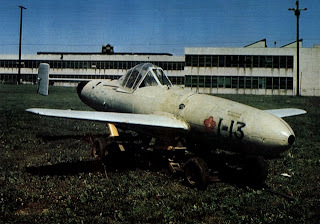 At the time the Ohka was displayed outside the Armoury at RAF Cottesmore where my father was the RAF Engineering Officer. This Ohka, serial number 997 went to Cottesmore after the small museum at Cranwell closed in 1961. After Cottesmore the Ohka went to Henlow and is now on display at the Manchester Museum of Science and Industry. It was my father's habit to occasionally "rescue" me from the primary school outside what we called the "camp" in order to be able to see close up and even sit in any unusual aircraft passing through but I can't remember whether the Ohka was one of these "special missions" or we went to see it from home. I presume he negotiated this visit with whoever was in charge at the Armoury shortly after the Ohka arrived there. I definitely recall the presence of another RAF officer during my visit but I don't know who he was. The origin of this particular Ohka is unknown as at least four were brought to Britain and one of these had been found at Singapore. My only regrets about these "special missions" is that I was not older to better appreciate them and that they were not photographed! In these days of po-faced officialdom, red tape, regulation and the dreaded elf''n'safety I doubt they would be possible. Good old Dad, his enthusiasm for unusual aeroplanes knew no bounds and unusually for his generation of serviceman he had an abiding admiration for Japanese aircraft. I remember him waxing lyrical about the phenomenal range of the G3M in the missions from Formosa to China at a time when he was "messing about with biplanes" on the NW Frontier of India (now Pakistan) and Iraq. He is sadly missed but the happy memories of his aeroplane enthusiasm remain. I'd build the glider/trainer version myself. 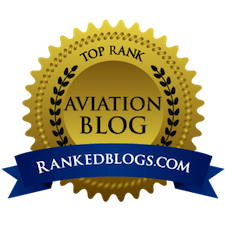 Great review and write-up. makes me realize I have to re-paint my Hawk and Hasegawa Ohka's-and may be-I consider building that awful A&V- Ohka K2 resin thing (1/72)! It looks alright but I hate resin.